When I realised that UHK is preparing materials for the new post on Craftowo nad it occured the topic would be "the mosaic" I knew that I had to try it! Not only becaouse she 's got an impressive talent to force people to do what she wants them to...but because I really wanted. The idea looked good - mosaic, small elements, fragments and a lot of geometry - byt not too much ;) Somewhere in my mind I kept the ideas for a mixmedia heritage project with my family - and this little mosaic seemed to be a good start! 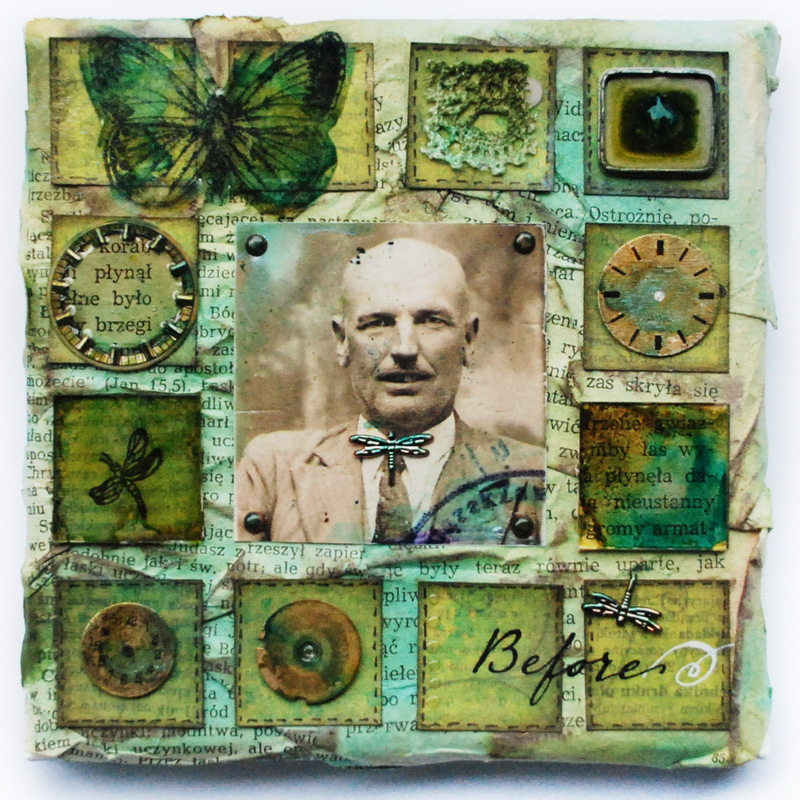 So - here is my first creation from the heritage project - one of my uncles composed with lovely green papers and embellies...Hope it is a good start! Materiały: Blejtram 15x15 cm, kartki ze starej powieści, papier "Oliwkowy Debiut" by Eight, Glimmer Mist - Patina i Honey Dew, Rub ons, kawałki akrylu i folii, koroneczka, elementy zegarkowe, ćwieki - ważki, ćwieki metaliczne, tusze alkoholowe. i ja się zachwycam kolorami..układem...dodatkami...całością..
Just gorgeous!! Is that canvas? Love all your altered projects soooo much!! No genialne toto jest i kropka !! !